A pair of bills filed Friday would allow any vehicle manufacturer to sell directly to Texans — bypassing the middleman dealers — in the biggest challenge yet to a longstanding state ban on the practice. 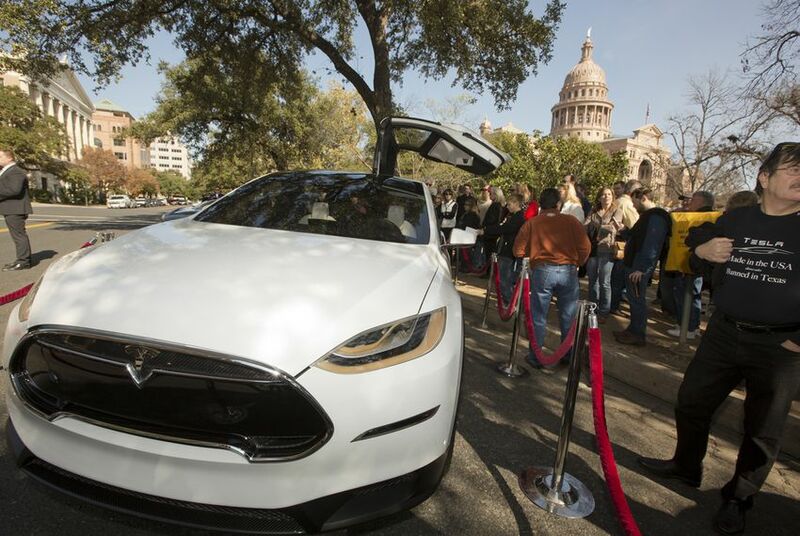 Tesla is not giving up at the Texas Capitol. In fact, it's getting more ambitious. Instead of looking to create any kind of carve-out that favors the high-end electric car maker, legislation filed Friday would simply allow any vehicle manufacturer to sell directly to Texans — bypassing the middleman dealers — in Tesla's biggest challenge yet to a longstanding state ban on the practice. The proposal "will allow manufacturers of vehicles any weight, class, size or shape to sell direct to consumers," said state Rep. Jason Isaac, the Dripping Springs Republican who filed the legislation in the House. "It’s a simple, free-market bill to allow that to happen." The legislation is likely to face an uphill climb in the Capitol, where previous efforts to make Texas more friendly to Tesla's business model have failed. The company does not yet mass-produce its cars, instead allowing customers to order customized vehicles that it later delivers to them. In Texas, Tesla showcases its cars at galleries in the Austin, Dallas and Houston areas, but because the galleries are not franchised dealerships, state law restricts employees at those locations from sharing information about purchasing the vehicles. Last session, Tesla beefed up its presence at the Capitol — more than doubling the size of its lobbyist team — and pushed legislation that would have allowed manufacturers that have never sold their cars through independent dealerships in Texas (like Tesla) to operate up to 12 stores. The House bill did not get a committee vote; the Senate proposal never even received a hearing. This time around, Tesla is hopeful the legislation is written in a way that assuages concerns that it is giving preferential treatment to the company. "There are no carve-outs, incentives, subsidies, breaks or deals for any manufacturers here," tweeted David White, who has previously served as a spokesman for Tesla in Texas. "This is all about the consumer and it’s the direct sales model Texans have been asking for." Dealerships have long argued the Texas direct-sales ban protects customers by ensuring that they have locations where they can buy cars across the state, not just in highly populated cities where manufacturers, if given the chance to sell directly, might otherwise set up shop. The opposition to such legislation also has an ally in Gov. Greg Abbott, who said after the 2015 session that Texas' automobile sector seems to be "working quite well the way that it is." "Tesla’s legislation seeks to unravel the entire franchised dealer system in Texas, in favor of direct sales of motor vehicles by a manufacturer," Texas Automobile Dealers Association president Bill Wolters said in a statement Friday. "SB 2093 and the reduced competition it will bring about in the new vehicle sales and service market will come at the expense of Texans and Texas." "No other vehicle manufacturer is seeking to change the law, and Tesla doesn’t need to either," Wolters added. For Isaac, the issue goes beyond Tesla. He recalled having something of an epiphany after recently touring an Amazon facility in Texas and seeing robots zip around with pallets: What if similar technology could one day be used to haul containers up and down the state's highways? "I really believe in the next 10 to 20 years we are going to see a complete change in our transportation system," Isaac said, "and the last thing I want is any barrier to that technology being available." Isaac acknowledged his bill faces a "really, really steep uphill climb" at the Capitol. However, he said, "I think we should have the conversation." Abbott has suggested Texas law does not need a loophole to allow Tesla to do business in the state. Tesla struggled to make progress under the pink dome last session. Disclosure: Tesla Motors Inc. has been a financial supporter of The Texas Tribune. A complete list of Tribune donors and sponsors is available here.